IP.Board is a powerful forum software geared towards delivering a rich experience to its users and providing site admins with an array of personalization and moderation options. There’s no paid endorsement involved here, however, I’ve spent a considerable amount of time on various discussion boards in my life and I have to say this might be the forum software offering the most I’ve seen. Take a look below for a concise summary, and also to learn how to get IP.Board chat module installed. The developers of IP.Board have taken the issue of community engagement to another level. Discussing all the features of this forum software is way beyond the scope of this post, so please follow the link to learn more. For now, I’d like to just briefly mention things like keeping track of unread content, topic tagging, WYSIWYG post editor, automatic video and audio posting, built-in polls, reputation points and content notifications. All of these options, and more, make using IP.Board a rich experience for all forum members. On the other hand, site owners have access to stuff like advanced moderation – content approval queue, user warning system, report center, spam protection, logs and access control. 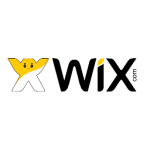 Moreover, they can customize their forums in terms of appearance, localization and various hooks, which are small plugins changing the existing functionalities. So, the thing I’d like to get you hooked on is IP.Board chat module. A nice little add-on enhancing the interactiveness of your online forum by providing a medium for real-time communication. Follow the steps below to learn how to install chat plugin for IP.Board. Download IP.Board chat plugin and extract the files to your computer hard drive. Upload the .php file located in the UPLOAD folder to your FTP directory with the same name (that is, Upload). Log in to the IP.Board Control Panel, locate the Applications & Modules tab in the column on the left side of the screen and click on Manage Hooks. 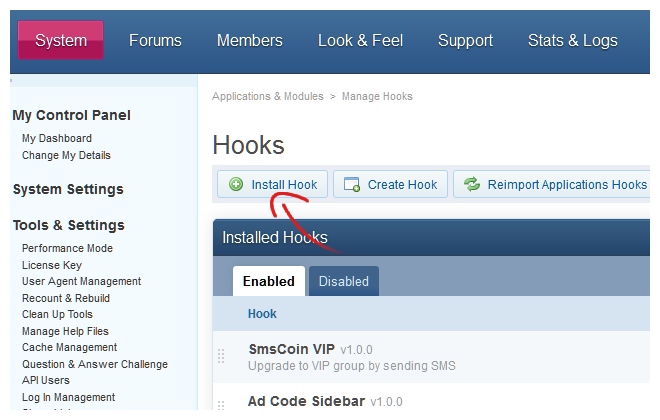 The screen will now display the list of enabled hooks (small add-ons) on your forum. Find the Install Hook button above the list. 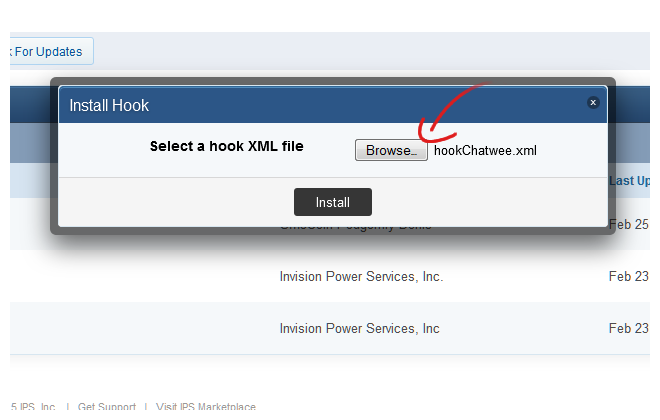 Click on it and browse the IP.Board chat plugin folder you downloaded earlier for the hookChatwee.xml file. 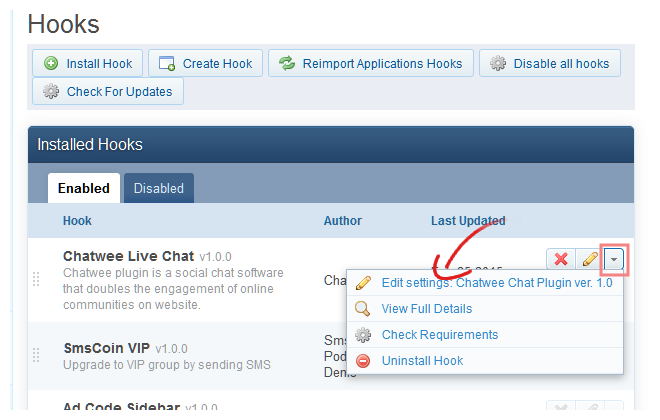 After you install the file, stay in the Manage Hooks section to finish integrating IP.Board chat module. 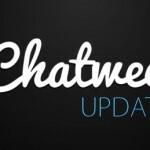 Locate Chatwee Live Chat on the list of hooks, navigate to the right and select the Edit settings: Chatwee Chat Plugin option from the little drop-down menu. 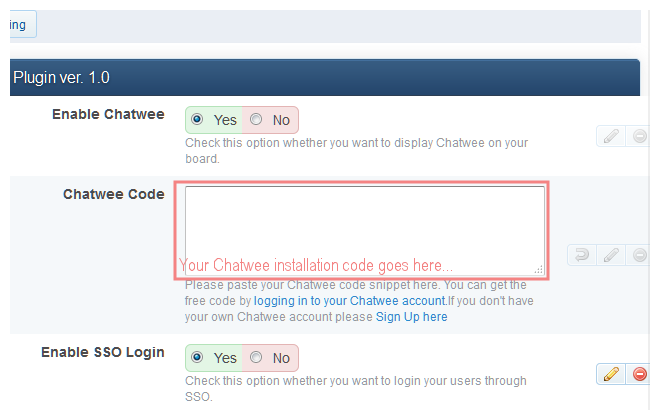 Once you’re there, paste the Chatwee Installation code copied from the home screen of your Chatwee Dashboard into the Chatwee Code field. Click the Update Settings button below and you’re all done. 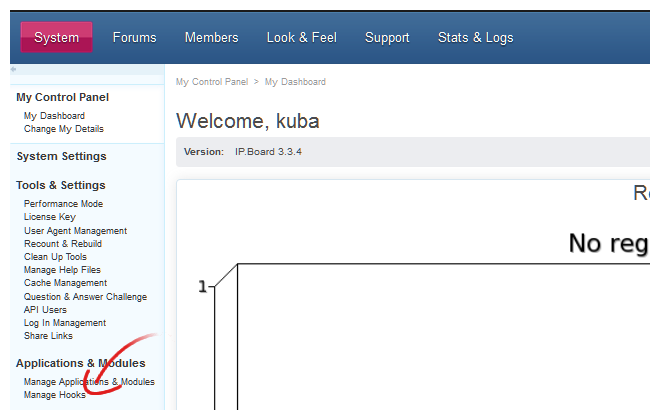 Great thing about IP.Board chat module is that its flexible and you can customize it to make it match the look of your forum. Among the options that may interest you the most are the chat’s appearance (its color, size, location on the screen, etc. ), the fact that you can select one of 34 languages available and the Single Sign-on option, where the person who logs in to your discussion board gets automatically logged in to the chat as well. Essentially, IP.Board chat module enriches the experience of your forum members by providing them with a tool to hold private and public conversations in real-time. In order to view all the personalization options and implement them easily, log in to your Chatwee Dashboard and go to the Customization section you’ll find on the left side of the screen. Should you have any more questions, don’t hesitate to Contact Us. We also encourage you to browse the Chatwee Support Center or follow the links below to learn more about various aspects of IP.Board chat module integration.